The Amazon Echo Show provides a lot of customization options that can enhance your lifestyle that goes well beyond its basic setup using both advanced settings and add-on Alexa Skills. You can use advanced settings to change your device location, manage your calendar, get weather information for any location around the World, and also fine-tune accessibility features if you are hearing or vision impaired. Here are details on key ways you can customize the Echo Show work best for you. Here are ways you can fine-tune your settings. Device Location: As a result of the initial setup process, the Echo Show knows your location, time zone, etc... However, if you would like to manually change your location all you have to do is tell Alexa to "Go to settings" or select Settings using the touch Screen - Select Device Options - Device Location. When you reach Device Location, use the onscreen keyboard to enter a new physical address. Calendar: One the great things about Echo Show is that you can use it to organize your periodic household, shopping, travel, business, or vacation events. On the Echo Show, tell Alexa to "Show me my Calendar". Once your calendar appears on the screen you can command Alexa to "Add an event to my calendar" or "delete my event" (specify date/time). Weather and Other Information: For the Echo Show, just say "Show me the weather" and your screen will display weather information similar to what you would see on a web page. By default, the weather information will correspond to the location of your Echo Show. However, you can find out the weather for any location by just providing Alexa any needed city, state, country information.You can also ask the Echo Show to display weather information for the next day or other days if that information is available. In addition, you can further customize the weather information feature to display or state temperatures in either Fahrenheit or Celsius. In addition to weather, you can use the Echo Show to provide Traffic information and Sports updates, which can be displayed on the Echo Show screen. Accessibility: The Echo Show provides several options to enhance accessibility for those that either hearing or vision impaired. For the hearing impaired, via the onscreen menu settings, you can activate Closed Captioning for supported content. Using the Message Touch feature, you can view transcripts of voice messages. For those that are vision impaired, the Echo Show provides a Screen Magnifier that can be controlled by physical gestures. Color Inversion, which is handy when you prefer that white text on a black screen or black text on a white screen. Color Correction can optimize the screen display to compensate for varying degrees of Color Blindness. Since the Echo Show has a screen, you can watch videos, TV shows, and movies via Amazon Video and other select services. On September 26, 2017, Google pulled official YouTube video support from the Echo Show (as well as Amazon FireTV products). As a workaround, Amazon takes you to the Firefox or Silk web browser version of the service. If you subscribe to Amazon Video (including any Amazon streaming channels, such as HBO, Showtime, Starz, Cinemax, and more...), you can ask the Echo Show to "Show me my video library" or "...watch list". You can also verbally search for specific movie or TV series titles (including by season), actor's name, or genre. In addition, playback can be controlled by verbal commands, including not only by such commands, such as "play", "pause", "resume", but you can also go back or skip ahead in time increments, or command the Echo Show to go to the next episode, if watching a TV series. Another interesting video playback feature is "Daily Briefings". This option displays short timely video news clips with the command "Alexa, tell me the news". Searching a listing of news sources that you can customize, the Echo Show will start showing short video news clips. Content participants that you can select from including CNN, Bloomberg, CNBC, People Magazine, and even clips from NBC's Tonight Show with Jimmy Fallon. It important to note that although you can view video clips, trailers, movies, and TV shows from select services on the Echo Show screen, the Echo Show cannot push (share) that content onto larger screen TV. Also, the Echo Show does not provide access to all of the app selections offered on Amazon Fire TV devices. However, you can use Alexa, via the Echo Show to tell a Fire TV device what to show on your TV, in place of a Fire TV remote. Just as with other Echo smart speakers, the Echo Show can find and play music. Just ask the Echo Show to play a song, artist, or genre. If you subscribe to Prime Music, you can also command the Echo Show to play music from that source with such commands as "Play rock from Prime Music" or "Play top 40 hits from Prime Music". In addition to the above music playback options, you can view Album/Artist art and song lyrics (if available) on the Echo Show screen. You can turn music lyric display on or off with simple Alexa commands, or tap the Lyrics icon that is shown on the screen. If you have multiple Echos in your home, calling them all Alexa may get confusing. But you can change what you call the Echo to prevent that confusion. Shopping: Online shopping on the Echo Show is easy and fun! Using the touchscreen or Alexa commands you can search for an item, such as "order an HDMI cable" or "order a broom". The screen will then display Amazon's top-rated products in your search category. If you want to see more options, you can command the Echo Show to "show more" or "show me more" or swipe the touchscreen. If you need more information on specific products, just say "select number" 1,2,3, etc...Once you have made your choice, you can select and buy it buy just saying "buy this" and then following the checkout and payment procedures as prompted. Although you can purchase items individually, the Echo Show will not allow you to purchase multiple items on an existing Amazon Shopping Cart. Alexa Calling and Messaging: To use Alexa Calling and Messaging with the Echo Show, first you need to use the Alexa App to establish your contact list. You can add or subtract contacts as needed.For voice-only calling or messaging, you can use the Echo Show to call or message anyone that has a compatible device (Echo, smartphone, tablet) that has the Alexa App installed. You can also use Alexa to make free outgoing voice phone calls to anyone (or any business) in the U.S., Canada, and Mexico even if they aren't on your Amazon contact list by asking Alexa to dial the number - However, this feature does not support calling 911 and only those on your Amazon contact list can initiate calls to your Echo Show. For video calling, both parties need to have an Echo Show. 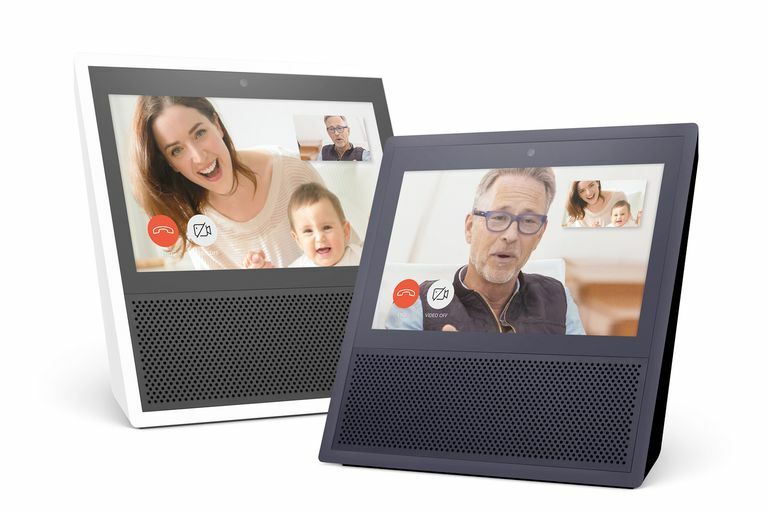 To make a video call, you can command the Echo Show by saying something like: "Alexa, call Mom" or "Alexa, call (insert name). You can also make audio-only calls to any compatible Echo, or audio-with-video calls to those with an Echo Show. You always have the option to make audio-only calls with the Echo Show, if you so choose. One additional video calling feature is "Drop-In". You can enable Drop-in for any person on your contact list (with prior their permission) or for any Echo devices in your house (such as bedroom, kitchen, etc...). With Drop-in, you can, without using the traditional phone-call/answer, instantly connect to any Echo or Echo Show device on your list. You do not need anyone on the other end to acknowledge your "call". You can disable the video portion of the feed by saying "video off" or by touching the video on/off icon on the Echo Show touchscreen. You can end drop in at any time by saying "hang up" or by touching the end button on the Echo Show touchscreen. Needless to say, Drop-in is somewhat controversial, as you can check-in or "spy" on a person or location of any Echo or Echo Show device on your designated list without acknowledgment by someone on the other end. However, a brief musical tone does sound on the receiving end that can be heard if the person being dropped in on is close enough to hear it. Food Network and Allrecipes - Don't know what to cook tonite? Get some inspiration from the Food Network, and/or Allrecipes provided by Allrecipes skills that you can enable for the Echo Show. Once enabled, for Food Network, just say "Alexa, ask Food Network what's on right now". Depending on your request, you can view photos and recipes, or choose from a listing of cooking videos. For All Recipes, just say "Alexa, open Allrecipes" or if you have something more specific in mind, you can say "Alexa, ask AllRecipes for a roast beef recipe". You will be able to view photos of the completed dish, along with the recipe. However, AllRecipes, at this time, does not provide video clips. Uber - Are you an Uber user? If so, you can use the Echo Show to reserve a ride with the popular transportation service. Just enable the Uber skill and say "Alexa, ask Uber to request a ride". Smart Home Control: Just like other Echo devices, with Alexa, the Echo Show can function as the control center for your home. For example, you can use the Echo Show as a security camera monitor, lock and unlock doors, set thermostats for areas of the home, control room lighting, and provide limited control of compatible home entertainment devices, including TVs, home theater receivers, motorized screens/wall mounts, and more, either directly, or through compatible remote control devices, such as the Logitech Harmony remote control family. However, it must be pointed out that additional purchases of control accessories and compatible home entertainment devices must be made to effectively use the Echo's smart home features so that they can communicate with the Echo Show.